Happy Thursday everyone!! 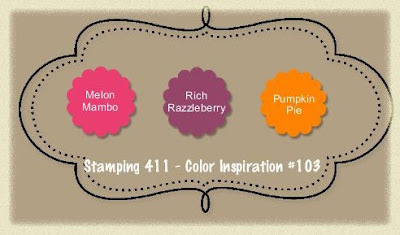 Every Thursday it's my pleasure to present you with the Stamping 411 Color Inspiration. There's a BIG 'ol snowstorm blowing here in MN right now!!! The snow started this afternoon and isn't expected to end until sometime Saturday. They're not even forecasting how much snow we are going to get.....they're just saying "significant". Well, with a forecast like that, I wanted this week's color challenge to be BRIGHT!!!! Actually, these colors were inspired by a card I made this week......but I can't show it to you just yet. I don't want to spoil the surprise. I'm sorry to keep this post short, but it's just one day until Christmas. And to quote the magician from Frosty the Snowman, we are "busy, busy, busy". I know many of you are so incredibly busy as well. If you find the time to play over the next week, please leave a comment with a link to your project. We just love taking a peek at your creations. Thanks for playing along........the operators truly appreciate it!! 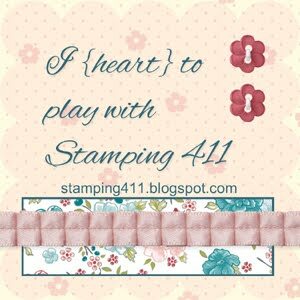 Happy Holidays and Happy Stamping everyone!! I'm still learning how to do all this. Sorry about having to delete the above. This was a fun challenge, and one of my first ever! A great way to spend an hour on Christmas! Merry Christmas! Ooh, Gorgous colours! I wish we were getting them here in Australia... love that razzle berry. 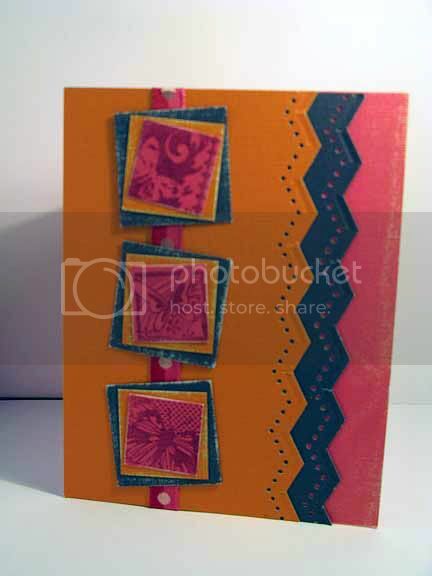 Just posted my card so please visit, loved the colors in the challenge. It's amazing how many different ideas come out of one set of colors, these looked like birthday colors to me. Creativity is so much fun. I loved using these colours together. 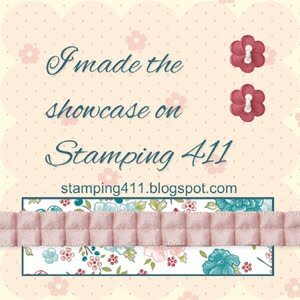 I hope I'm not too late linking my card!